After having time to reflect on the 2015 Amgen Tour of California and my experience with GU Energy Labs, it is time to make an attempt at putting thought and emotion into indescribable experiences. Also, Yuri Hauswald, the Cycling: Marketing Manager for GU Energy Labs, recently noted an impressive sequence of memories. Phase One: Stage 4 - Pismo Beach to Avila Beach. For me, it all began in my new backyard, as a current student at California Polytechnic State University, San Luis Obispo. While I surely possess a prominent sense of bias, I do believe it is fair to claim that this particular stage route was one of the more impressive, beautiful, and interesting. With a rolling start on the Pismo Beach Pier and an extended southern loop, Stage 4 marked a combination of flatlands, canopied climbs, sketchy highway pedaling, and beachside sprint finishes. Pismo Beach Pier. Photo credit: Yuri Hauswald. Headed south. Sean Bird (left) and my pops, Lee Bird (right). 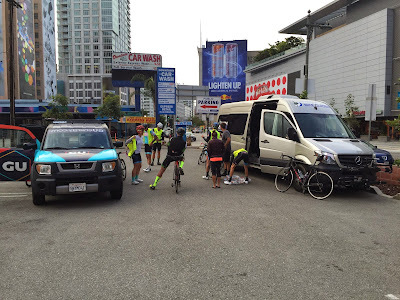 However, Stage 4 was more than a cycling adventure. It was a time for me to engage in thorough, meaningful discussion with new counterparts. It was a privilege to spend time with members of the GU "Core Six" who were partaking in an eight day endurance adventure, while including product analysis and testing. Also, the GU support team were amazing. Three individuals who managed to always produce a smile, while selflessly supporting physically exhausted and needy cyclists. The sun was out at the end of Stage 4. Lee Bird (left) and Sean Bird (right). Unfortunately, I was not able to skip class for Stage 5, as suggested, so I was left to imagine a fun-filled weekend, before returning to class. Phase Two: Stage 7 - Ontario to Mt. Baldy. #MoreKidsOnBikes was a weekly theme and I was fortunate to cruise with the GU "Core Six" and a host of Team Rokform junior cyclists. Stage 7 was no easy day, as it included three significant climbs near my hometown in Southern California. It was amazing to spend the day surrounded by a host of gangly and eager juniors, while climbing with GU Co-Founder and CEO Brian Vaughan. He kept me honest, we shared some good tales, and I was able to view a glimpse of significant product and performance testing. Sean Bird (left) and Brian Vaughan (right). Photo credit: L'Etape. I did not make it to Mt. Baldy on Stage 7. After hearing a rumor of snow at the peak, my pops and I decided to pedal a limited amount, before viewing the professional cyclists at work. The running engine of a police cruiser kept us warm, before a chilly descent. At the base, we were able to shed cold weather clothing that had been used throughout a day of heated climbing and crisp descents. We lived to fight another day. Phase 3: Stage 8 - L.A. Live to Pasadena. Stage 8 was the final push for the GU "Core Six" squad. It was a pleasure to roll into Pasadena and the Rose Bowl with my father and a group of friends. Cycling has provided me with a plethora of opportunities. After essentially learning to ride a road bike at the Rose Bowl and completing countless three-mile circuits, the Rose Bowl had a renewed energy. 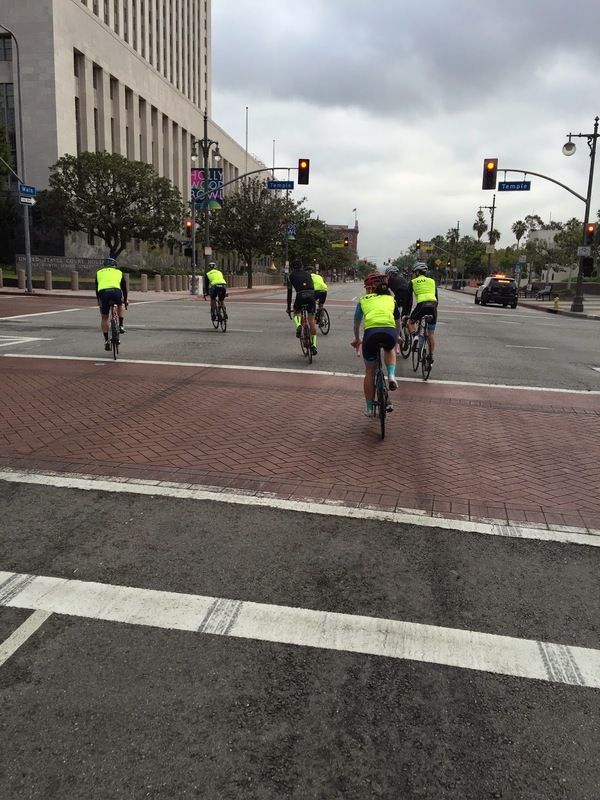 Pedaling through Downtown L.A. with a road closure. After entering the Rose Bowl and speaking with the GU "Core Six," about one hour remained before the professional finishing circuits. My father and I, alongside Brian Vaughan, rode some of the local hills in La Canada and Pasadena, before witnessing a thrilling finish. The 2015 Amgen Tour of California was complete and it proved to be a thriller. ... A Group of Friends and Memories. After having the privilege of completing multiple stages with a focused group from GU Energy Labs, it is fair to say that GU is more than a company and more than a product. For me, GU represents a group of friends and positive memories. While reaching for an energy gel, drinking from a GU branded water bottle, or wearing a GU branded piece of clothing, I partially consider the performance benefit, before indulging in positive thoughts, memories, and outrageous experiences. Overall, the 2015 Amgen Tour of California was the experience of a lifetime. I am stoked to have done it alongside the GU "Core Six," the GU support team, and my fantastic parents. I cannot thank GU and my family enough for their outstanding generosity and assistance. I will forever be indebted. Until next year, keep on moving.